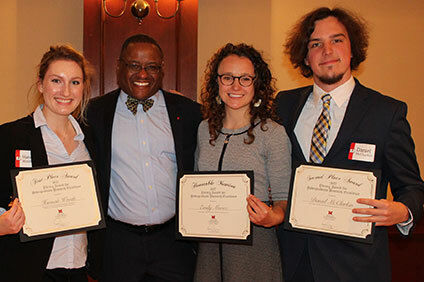 The Miami University Libraries are pleased to recognize Jacqueline Johnson, university archivist, and Elias Tzoc, head of the Create + Innovate Department, who received promotion to principal librarian during the Feb. 16 meeting of the Board of Trustees. Johnson arrived at Miami in 1991 as a minority resident librarian. She has dedicated most of her career to the university’s archival collections. From 2005-2015, she was archivist for the Western College Memorial Archives. In 2016, she became university archivist. Her responsibilities, which she describes as “an honor,” focus on developing, maintaining, supporting and promoting the use of the University Libraries’ archival collections, which includes collections from Miami University, Western College and Oxford College. She has been invaluable in promoting the role of Western College for Women during Freedom Summer (1964). In addition to supporting faculty and student projects on the subject, she was integral in the development of the Mississippi Freedom Summer Digital Collection Metadata Project and website as well as in organizing a Freedom Summer oral history program. More recently, she helped secure a collection of items related to the late Jerry Williams ’39, one of Miami’s first African-American student-athletes. Johnson is a member of the National Civil Rights Conference Planning Committee and the Afro-American Historical and Genealogical Society’s Commission on the 400th Commemoration of the First Documented Africans in British North America. She has served on committees for the Society of Ohio Archivists and is a member of Miami’s Celebrating Global Sisterhood Committees. Her scholarly contributions include 19 successful grant applications and more than 40 presentations. Most recently, she presented with Miami colleagues on “Lessons from 1964” at the National Diversity Symposium in Muncie, Indiana, and published in published in the Society of American Archivists’ Archival Outlook. She holds a bachelor’s degree from Limestone College and her master’s in library and information science from the University of South Carolina. Tzoc arrived at Miami in 2007 as a digital initiatives librarian before, in 2015, being named digital scholarship librarian for the Center for Digital Scholarship. In 10 years, he has worked and collaborated with a diverse group of colleagues, including faculty members, graduate and undergraduate students, officers from funding agencies, university administrators, and librarians from Ohio, the U.S., and several nations. Earlier this year, he was named head of the newly formed Create + Innovate Department, which is charged with the mission of enhancing scholarly work at Miami University by anticipating the resources, technologies, spaces and expertise that drive groundbreaking research, creative forms of expression, innovative tools for teaching, and new mediums for sharing the Miami community’s scholarly achievements. A partner with Miami faculty and students on a variety of digital projects, Tzoc played an integral role collaborating with Ann Elizabeth Armstrong, associate professor of theatre, in creating the Freedom Summer App, funded by a National Endowment for the Humanities grant and the winner of a national ALL-IN Challenge Award. In all, he has contributed to 11 significant digital projects in collaboration with Miami faculty and students, ranging from websites and apps to ebooks and digital collections. Active in the profession, Tzoc has contributed to nine successful grant applications totaling more than $130,000. He also has contributed to 17 publications; developed a host of digital library tools since made available to the public; and given nearly 40 professional presentations, most focused on the field of digital scholarship. He is currently a reviewer for two Latin American journals. He is also an adjunct instructor for the AIMS program. Principal librarians are promoted based on a record of continued excellence in job performance and leadership, demonstrated excellence in service to the profession and/or community, and a strong record of scholarship and creative activity. Submissions for the third Libraries Award for Undergraduate Research Excellence (LAURE) are being accepted through March 16, 2018. On Saturday, May 5, King Library hosts the Miami University Libraries' final game night of the spring. Come by between 6 p.m. - midnight for free food and the opportunity to join others from the Miami University community as we play strategy / tabletop, board, and card games. The library provides a number of games from its circulating game collection, including recent additions Splendor, Dominion, Mysterium, and Dimension. We offer many of the classics as well. You are also invited to bring your own games. These informal events are great for both beginners and experienced players. Just pull up a chair and join in the fun. Students, faculty, staff and families welcome! 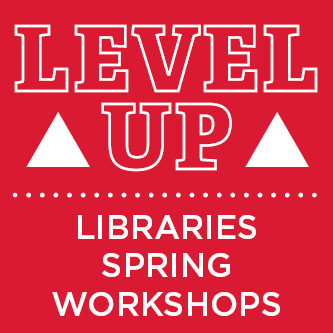 The Miami University Libraries are back in spring 2018 with a full series of 11 workshops focused on helping you achieve peak scholarly success. The series, hosted in partnership with the Rinella Learning Center runs into April. Pre-registration is available through the Rinella Center (for select sessions as they come available) but please feel free to drop by! Tuesday, March 13 – 5-6 p.m.
New to using the Modern Language Association (MLA) citation style? This primer workshop will get you well on your way to citing like a pro. Wednesday, March 14 – 5-6 p.m.
New to using the American Psychological Association (APA) citation style? This primer workshop will get you well on your way to citing like a pro. Wednesday, Mar 28 – 4-5 p.m. Learn the basics of this easy-to-use research tool for gathering, organizing and analyzing sources. Tuesday, Apr 3 – 5-6 p.m. Thinking about a career in libraries or information science? Learn about degree options and career paths in this informative panel presentation and Q&A session with Miami University librarians. Tuesday, Apr 10 – 4-5 p.m.
Presenting a poster at the Miami University Undergraduate Research Forum? This course covers the basics of research poster design and presentation. Tuesday, April 17 - 4-5 p.m.
How can you ensure that your digital “memories” remain accessible in in the future? This workshop teaches best practices, including file types and naming conventions, to preserve your digital memories. A new year has brought some exciting new changes, additions and upgrades to the Miami University Libraries. The Polk Patterson Graduate Reading Room has moved from its previous location on King Library’s third floor to the former Hill Faculty Reading Room (King 230). The move and decision to transition to one faculty reading room, approved by the faculty senate, places the graduate reading room in a more private space amid the book stacks and quiet study area. The space is receiving a general modernization, including new furniture. The ground-level of B.E.S.T. Library, damaged by flooding in the fall, has undergone a minor renovation, including fresh paint, new carpeting and a reconfigured and relocated seating/study area. The Libraries digital collections have welcomed seven new online databases, creating 24/7 access for students and faculty to thousands of articles, videos, periodicals and other documents and teaching tools. Learn more. Miami University’s One-Button, formerly the One-Button Studio, is new and improved, featuring a more user-friendly interface and better quality picture. The improvements were made using student and faculty feedback gained since the concept was initially piloted in 2016. It will be tweaked and tested throughout Spring Semester 2018, so keep the feedback coming! Wertz Art & Architecture Library has upped its drawing tablet game, adding six Wacom Intuos Pros and four iPad Pros with the powerful digital illustration app procreate. The Intuos Pros are available for three-hour or overnight checkout. The iPad Pros can be checked out for up to 24 hours at a time. King Library installed upgraded HD digital display technology in 11 study rooms. The Kamm Electronic Instruction Room (King 110) is piloting a new configuration during spring 2018 to improve viewing angles for instructional purposes. 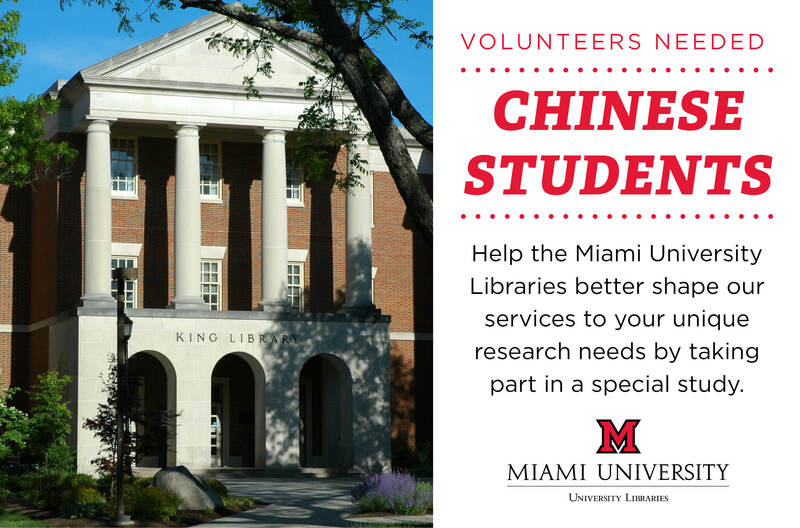 The Miami University Libraries are seeking volunteer Chinese students to participate in a study exploring how Chinese students perform research in relation to classroom assignments. The study seeks to explore and better understand the information needs of Chinese patrons, so Libraries’ services can be enhanced to better meet those needs. Participation is strictly voluntary, and those interested must be at least 18 years old. The study involves a 30-minute one-on-one interview, and participants have the freedom to stop the interview at any time or skip any question(s) they do not wish to answer. Anonymity is guaranteed, and only the research team will have access to participant responses. In addition, you may contact the Research Ethics and Integrity Office at Miami University, 513-529-3600 or humansubjects@MiamiOH.edu, if you have questions about the rights of research subjects. Carla Myers, Miami University Libraries assistant librarian and coordinator of scholarly communications, has been selected to serve on a statewide taskforce focused on reducing textbook costs for students. OhioLINK announced Myers as one of eight Open Textbook Network (OTN) System Leaders, who will be responsible for coordinating OhioLINK OTN awareness and advocacy initiatives regarding open educational resources (OER) and open textbooks. All system leaders were nominated by their deans or directors. With the cost of textbooks increasing by 73 percent since 2006, this initiative is important for combating rising costs in higher education. Myers, along with her OTN peers, will be participating in the OTN’s Summer Institute (OTNSI) at the University of Minnesota from August 7-11. OTNSI will prepare OTN staff to coordinate workshops that will focus on developing campus advocates at Ohio higher education institutions who lead in the effort to reduce textbook costs for students. System leaders will also assist with affordable learning awareness and advocacy initiatives. Gabriel Neff joined the Miami University Libraries in November 2016 as a library technician and the evening circulation desk supervisor at King Library. He grew up in Cincinnati, graduated from Northern Kentucky University and began working in the library environment as a student worker during his college days. I grew up in Mason, Ohio. After attending Archbishop Moeller High School, I was a student-athlete (football) at Seton Hill University for two years. I hold a B.A. in organizational leadership from Northern Kentucky University. I am a library technician as well as the evening Circulation desk supervisor. I help ensure that everyone who comes to the circulation desk has a positive experience as well as connecting students to the resources they need. I first started working in libraries as a student employee at NKU. I found that I liked helping my fellow students and enjoyed the benefits of working on campus. I ended up completing my internship at NKU's Steely Library, working primarily in circulation and stack maintenance. A couple years later I moved to Morgantown, West Virginia, with a former college roommate and started working at West Virginia University. I was at WVU for two years, working in facilities management and residential education. Miami's excellent reputation as an academic institution, competitive pay and benefits, as well as the opportunity to come back home to Southwestern Ohio were all major factors in choosing the Miami University Libraries. Being involved in the Miami community, helping students, patrons and guests. That library staff is always there to support them in any way. Never hesitate to ask for help. Spending time with my fiancée. Hanging out with family around Oxford. Playing on the Libraries' broom ball team. Watching Bengals, Reds, Blue Jackets, Miami and WVU games. I played the clarinet and viola as a kid. 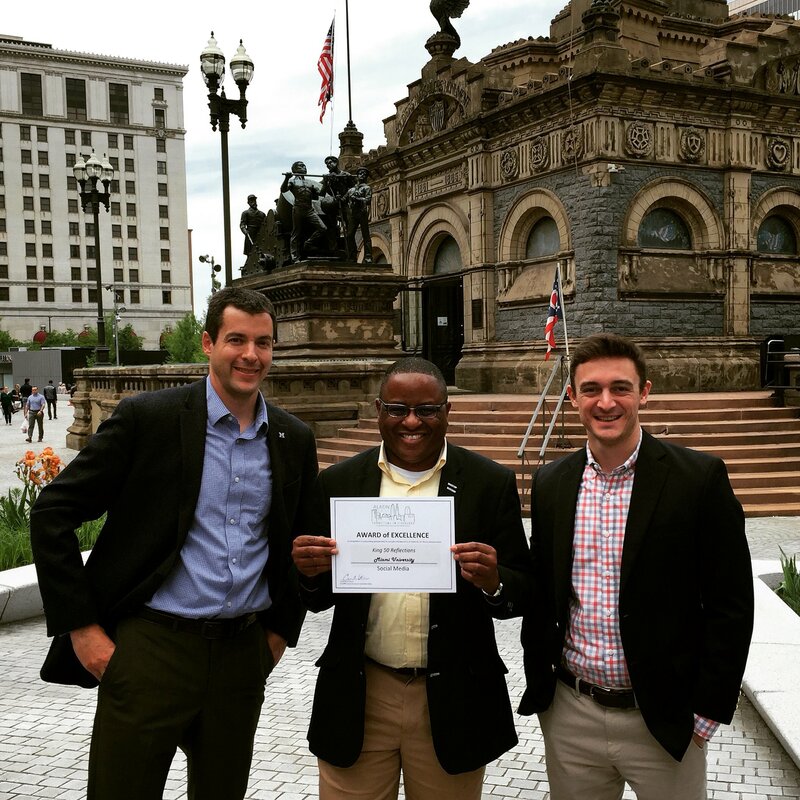 CLEVELAND—The Miami University Libraries’ #King50Reflections social media campaign earned national recognition, Tuesday, May 23, at the Academic Library of Advancement and Development Network (ALADN) Conference. The campaign, built around the memories and reflections of Miami alumni in honor of King Library’s 50th anniversary, earned the ALADN Award of Excellence in the category of social media. The ALADN Communications Committee presented one award of excellence in each of 15 communications categories. Led by Vince Frieden, strategic communications coordinator, and David Mulford, interim strategic communications specialist, the #King50Refelctions campaign included a Flickr gallery of more than 40 alumni reflections, ranging from humorous recollections to serious reflections about the impact the library had on academic and life successes. The Flickr gallery drew more than 250 views and a series of Tweets recorded more than 20,000 impressions. The February edition of the Miami University Alumni Association Enews and spring/summer Miamian magazine both highlighted #King50Reflections. The campaign also resulted in a spinoff Valentine’s Day compilation, featuring the stories of Miami Mergers who met, enjoyed study dates and even experienced first kisses in and around the University Libraries. In developing the campaign, the University Libraries collaborated extensively with University Advancement Communications, Marketing and Events, including Kim Tavares, senior director; Suzanne Clark, assistant director, electronic communications and social media; Nicki Russell, coordinator for marketing, communications and special events; and Auriel Buchanan, copywriter. ALADN, founded in 1995, is a library fundraising community open to professionals involved in development and advancement throughout North America. More than 170 professionals from 100-plus colleges and universities in the U.S. and Canada attended the 2017 conference in Cleveland, which also featured two presentations by Miami University Libraries staff. I am originally from Chesapeake, Ohio. I have BAs in history and political science, and MA’s in journalism and library science. I am currently at work on my dissertation, where I focus on the development of journalism education in the United States. I am an academic resident librarian for Information Services at King Library. At Miami University, I lead instructional sessions for first-year students and serve as the subject liaison for the department of media, journalism and film, and the Armstrong Institute for Interactive Media Studies (AIMS). I like to work with students and faculty, and I enjoy supporting their research. Miami University has an excellent reputation for both teaching and undergraduate research, and I wanted to be part of that tradition. The best part of working in a library is being exposed to fresh ideas and new perspectives. We help students and faculty with their research needs, but they also help us stay current on research trends and new areas of interest. I wish college students knew how eager librarians are to help them with their work. They just have to ask. My favorite book is Herzog, written in 1964, by Saul Bellow. I enjoy live music, and outdoor activities. I was on PBS’s Reading Rainbow as a kid. No, I did not get to meet Levar Burton.